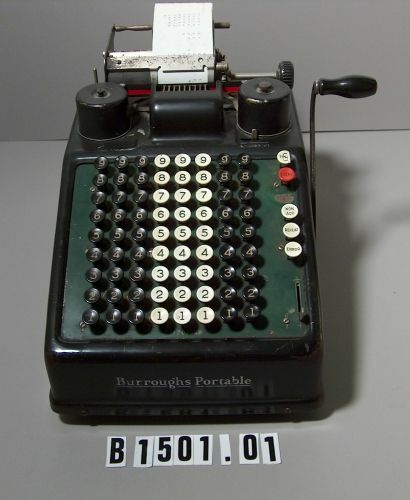 The object consists of an adding machine with an insstalled red and black ribbon and an installed roll of 2 1/4-inch wide paper tape. There are 21 lines of printing on the paper tape. White printing on back of cover says, "Burroughs" in large type followed by a smaller line of type that apparently was smeared when printed. The second line of type appears likely to refer to protection under U. S. and foreign patents.